Hello! 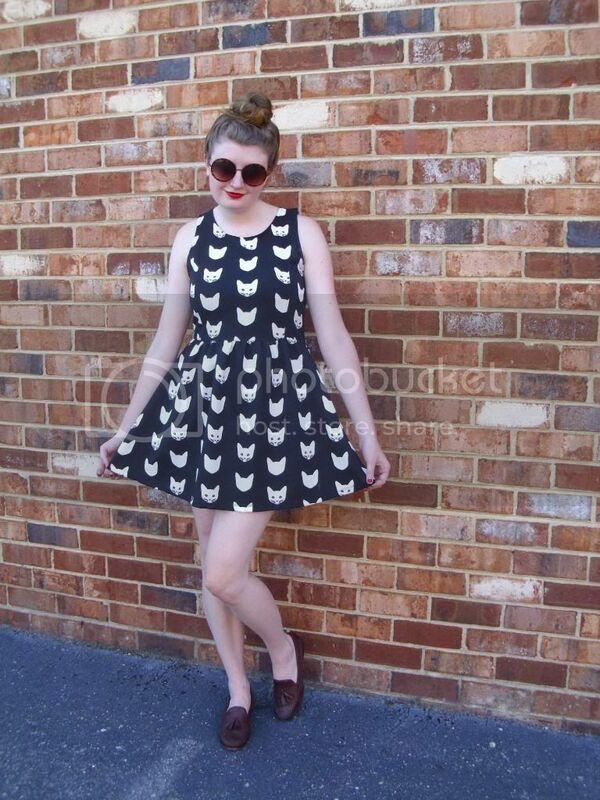 Today, I pulled my kitty cat dress out from the depths of my wardrobe. It has easily been over a month since I've worn this dress and I can't believe it. While I was at school, this dress was practically being worn on a weekly rotation. Somehow, this dress was pushed to the back of my closet when I came home and I had forgotten about it until I pulled it out to wear today. 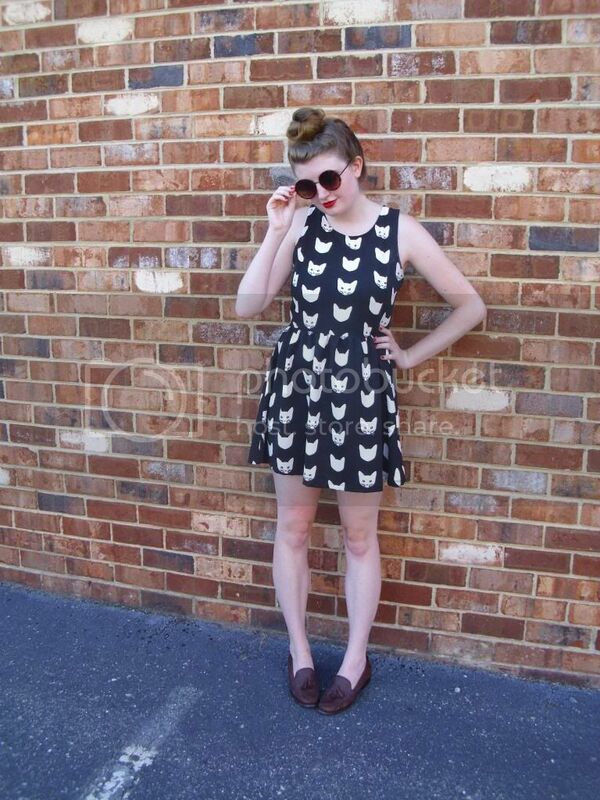 I styled the dress with a pair of round sunglasses and vintage loafers. These menswear-inspired loafers are the newest addition to my wardrobe and I am already kind of in love with them. I picked them up at a thrift shop for a mere $8 this past Tuesday. When I first spotted them, they looked a little small and I didn't see a size marked on the shoe so I almost didn't pick them up to try them on. However, I couldn't resist the temptation and decided just to give them a go and see if they would fit. To my surprise, they fit perfectly when I slipped my foot in. Such stylish shoes for less than $10? Of course, I had to purchase them! Red lipstick and a chic bun completed my look. Hello! Richmond's summer heat and humidity continues to be the ultimate struggle for me. 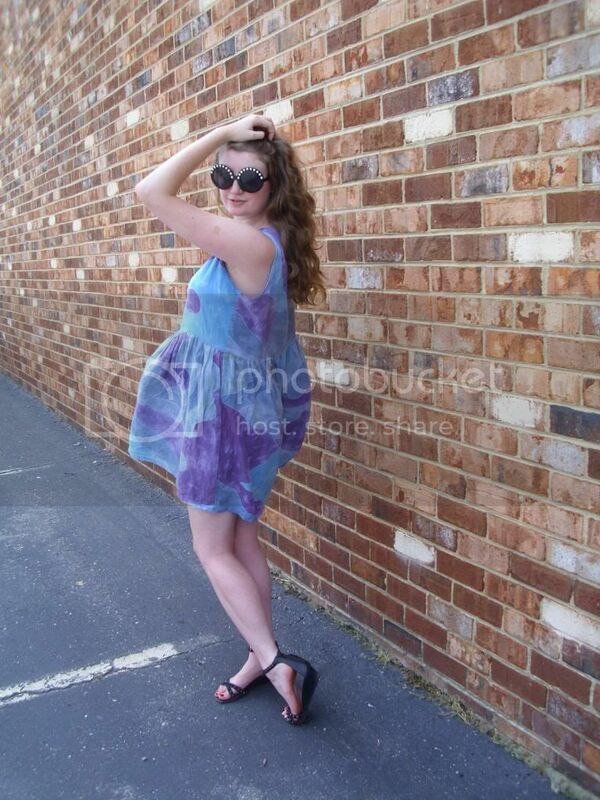 I've been sticking to a daily uniform of breezy dresses and bold sunglasses. This dress is probably one of my favorite dresses in my wardrobe right now (alongside my sunflower dress, denim babydoll dress and bold floral dress.) 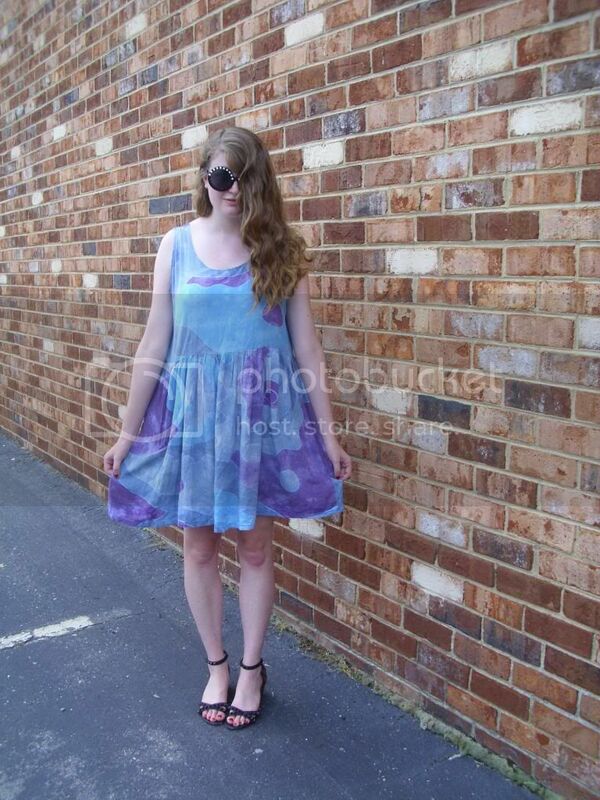 The free-spirited mix of shades of blues and purple thrown into one loose, babydoll style dress simply has me swooning. Even better, this dress has pockets! So if I go out and don't feel like grabbing a bag, I can easily just throw my keys and phone into my pockets and be good to go. So convenient. This dress actually used to be my mom's dress and she thinks that she has loaned it to me for a temporary period of time but I don't think she'll actually be getting this dress back; I'm simply too in love with it to give it up! She purchased it at a Grateful Dead concert in the 1980's which adds to the very boho, hippie vibe of the dress. 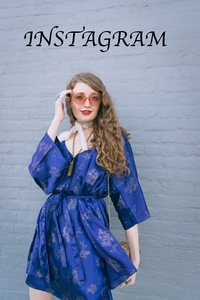 It would be the perfect dress to wear to a music festival and has me dreaming of living in the 1960's and attending Woodstock and seeing bands like the Grateful Dead perform live. 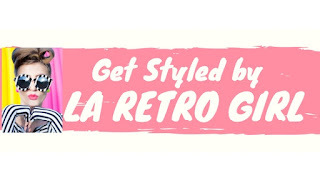 To complete this look, I threw on a pair of studded black sandals and bold, pearl-trimmed sunglasses. Hello! Attempting to look stylish in this summer heat continues to be the ultimate struggle. 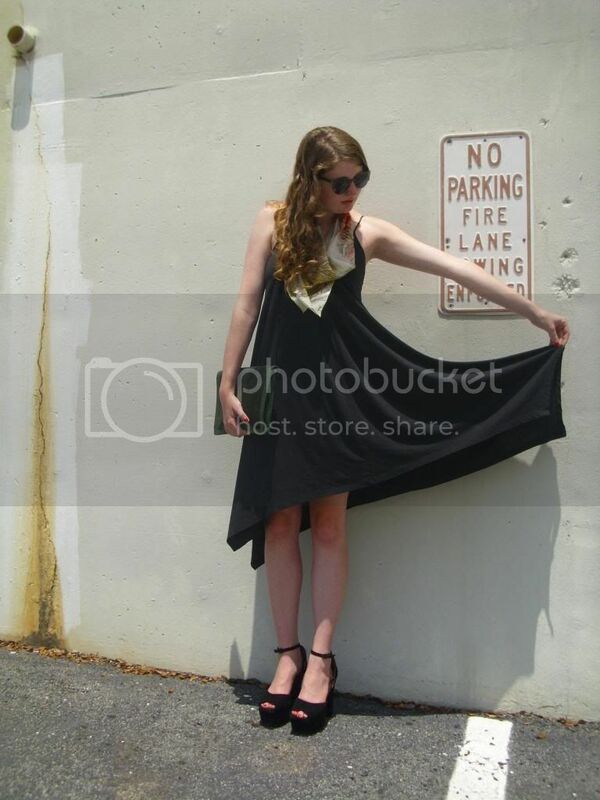 Easy, breezy dresses like this black asymmetrical dress continue to save me in the summer heat. I styled the dress with a lightweight scarf, forest green clutch, green sunglasses and a pair of killer black heels. Hello! This Richmond heat is slowly killing me this summer. I mean it's been in the high 90's for the past couple of days- how does one handle such hot weather?? In such hot weather, the easiest thing to do is throw on an easy, breezy dress so I grabbed this acid washed denim, babydoll dress out of my wardrobe. The loose fit of this dress is ideal for keeping cool (or at least attempting to keep cool) in this summer heat. I took the opportunity today to show off my tan Jeffrey Campbells. I purchased these last fall but haven't had a chance to wear them much. I'm determined to break them in this summer and wear them a lot more frequently. How can I (and how have I) just let these babies sit in my wardrobe collecting dust? I accentuated the 90's grunge feeling of this dress by pinning on several retro, 90s inspired pins onto the front of my dress. Green circle shades, intense red lipstick and forest green clutch completed the look. Hope you guys are staying cool in this summer heat! Hello! Happy Father's Day! My father has made me who am I today and is who I have to thank for several of my best characteristics including my long legs and penchant for reading. To celebrate Father's Day, my mom and I took my dad out to eat at Strange Matter in Richmond. We hadn't been to Strange Matter before and although it wasn't very crowded (probably because we went early), the edgy, grunge vibe of Strange Matter was very appealing compared to the cookie-cutter, boring restaurants of Short Pump. 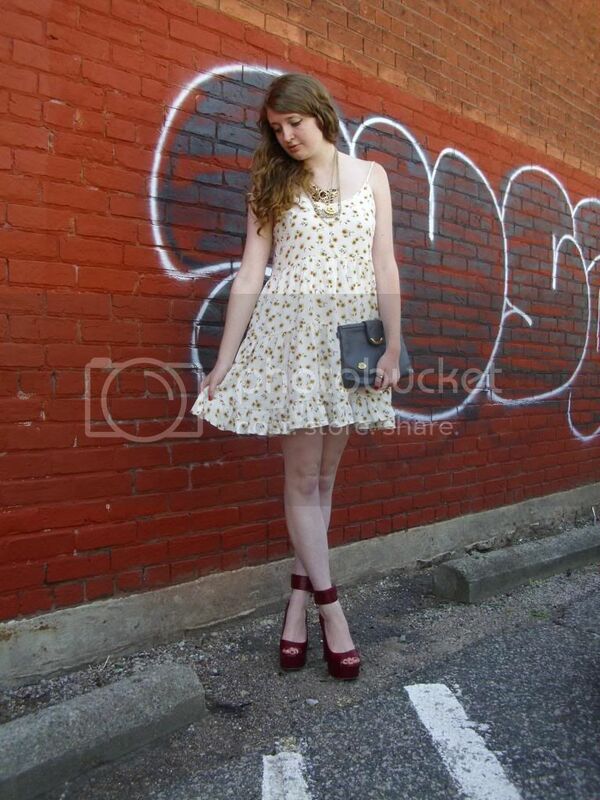 My mom took photos of my outfit alongside a wall covered in graffiti right outside of Strange Matter. For a photo of my dad and I on this outing, check out my instagram @ToriRadday. Since I don't work today and don't plan on spending too much time outside, I decided that today would be the perfect time to debut my new Jeffrey Campbells. A while ago I told myself I didn't need any more Jeffrey Campbells (as I already have three pairs) but I mean when I saw these on sale on Nasty Gal's website, how could I really resist? I mean c'mon. These are the "Jeffrey Campbell Girl Crush Platform Heel" in red matte leather. Originally retailing for $152, I scored these babes for just $43 including shipping. The platform heel and cherry red color practically having me swooning. Definitely a good investment in my wardrobe! I threw on a lightweight, sunflower-printed dress ideal for the summer heat. I accessorized with piles of golden rings, a handful of golden necklaces and a stylish gray clutch. Hello! 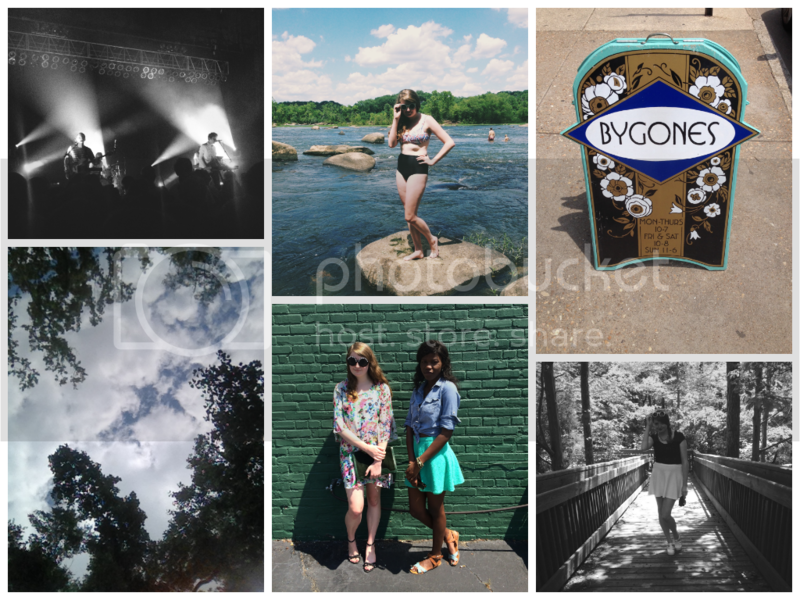 Today, I thought that I would share some of my summer 2014 snapshots from my iPhone camera roll with you guys. If you follow me on instagram @ToriRadday, you've probably already seen some of these photos but not all of them. As the summer continues on, I'm trying to complete as many items on my summer 2014 bucket list as possible; six out of ten items have been completed! 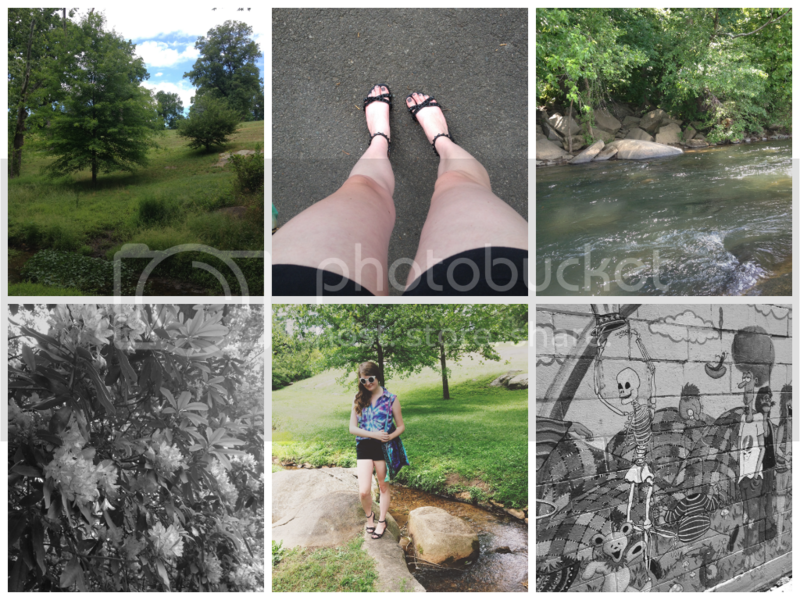 I've spent the day at the VMFA, spent the day at Belle Isle, spent the day at Maymont, watched a movie at the Byrd Theater, gone shopping in Carytown and taken photos with a disposable camera (can't wait to get them developed!) Many of these snapshots portray these activities. 1. Snapshot of the Washed Out concert at the National on June 4th. The concert was absolutely incredible and surely a show that I'll never forget. 2. Showing off my retro bikini in the sunshine by the James River. Currently obsessing over high-rise swimsuit bottoms. 3. Sign for Bygones- the cutest vintage shop in RVA. 4. Cliche photo of the clouds by the trees in the sky. 5. Photo from my blogger meet-up with Daniella of Danie Daily. Love this green wall in Carytown! 6. 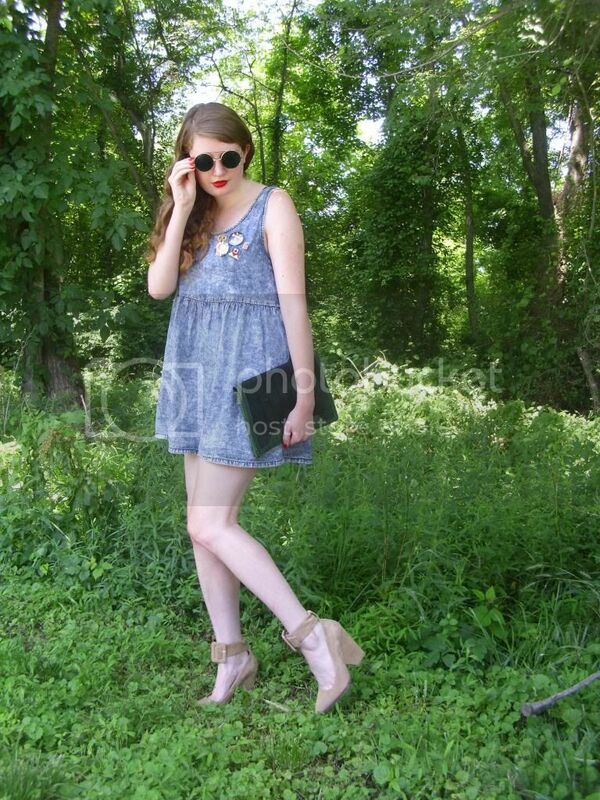 Unseen OOTD photo from a day spent at the park. 1. Broad view of Maymont. 2. 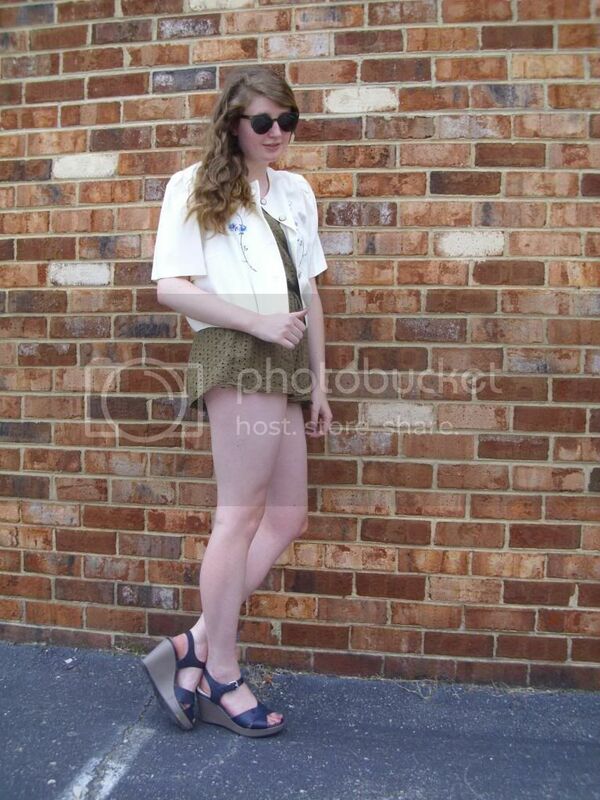 Spotted wearing black shorts & my black Jeffrey Campbell studded sandals. Forever wearing these sandals. 3. Photo taken on a trip to Belle Isle. 4. Black and white view of flowers at Maymont. 5. From a sunny day spent with one of my best friends. Loving tie-dye right now. 6. Seen on the streets of Richmond. Love the Grateful Dead-inspired mural. Hello! 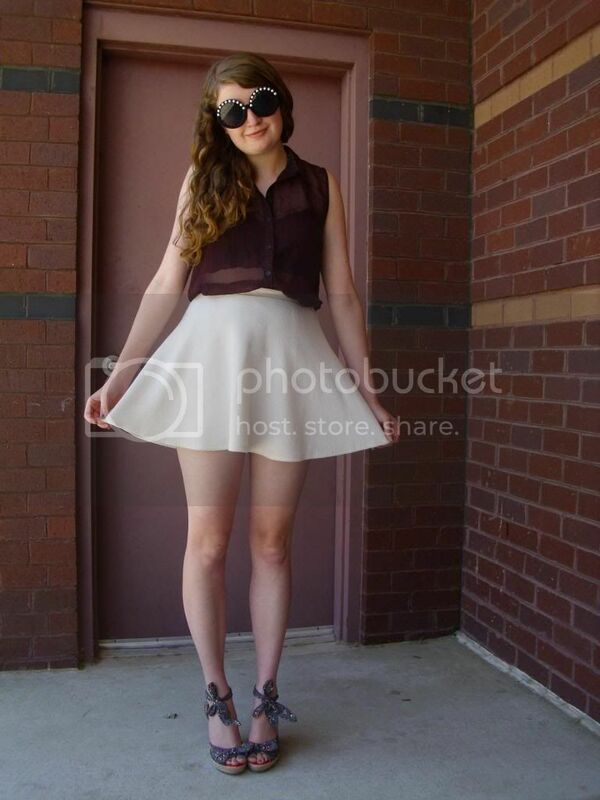 Today, I slipped into my white circle skirt. Although I typically tend to lean towards black and you guys know I love my black circle skirt, this skirt may be the summer equivalent of my black circle skirt. Is white the new black? I mean white is the perfect for color for summer. It's just so fresh and crisp. It conjures up images of sand white beaches and vanilla ice cream cones. Besides the fresh white color, the easy shape and subtle texture draw me back to this skirt time and time again. I styled the skirt with a black lace bralette followed by a sheer burgundy blouse- the perfect combination for the hot weather! 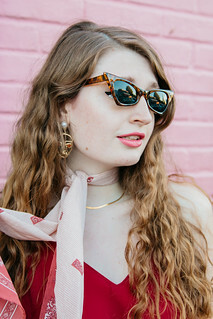 I accessorized with a pair of pearl embellished sunglasses and slipped on a pair of patterned wedges that emphasized the white, burgundy and black in my look. Hello! Today, I pulled my olive-colored romper out of my wardrobe. This is such a versatile piece ideal for layering and therefore is my go-to piece when I'm not sure what to wear. For this look, I slipped on a boxy, cream-colored blouse over the romper. I wore the blouse unbuttoned to show off the romper. This blouse was actually passed down to me by my grandmother. It is part of a dress-blouse set but I decided to just don the blouse today and save the dress to wear another day. I absolutely love the detailing of this top- the delicate pearl buttons, romantic floral embroidery, rich creamy color and boxy shape make this quite the vintage treasure and I'm lucky to have it in my wardrobe! I highlighted the colors of the floral embroidery in the blouse with a pair of navy wedges. I love the way that the combination of these wedges with a very short romper makes my legs look like they go on for miles. Olive green sunglasses completed the look. I hope that you guys are enjoying the start of your summer!